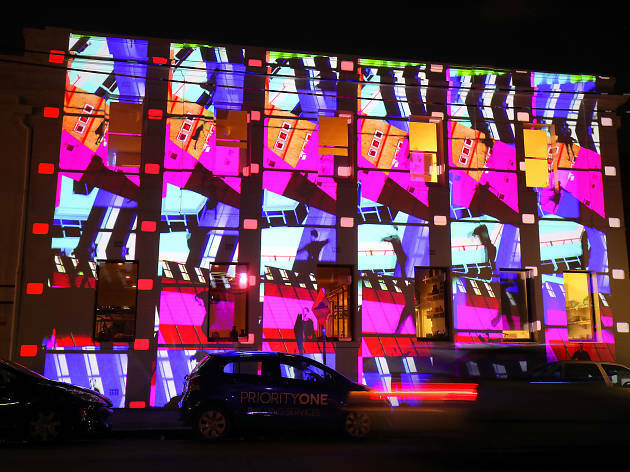 Gertrude Street Projection Festival turns 10 years old this year. Over that time, the annual festival has developed from niche event to a major free exhibition that envelops Gertrude Street with a kaleidoscope of projection art and illuminated installations. With the festival ending on Sunday July 30, we've done a round-up of the best artworks we've seen this week – catch them while you can. Ash Coates' mystifying work Mycolinguistics uses a mix of paintings and digital media, wrapping the now-closed Gertrude Hotel with a swirl of Paddle Pop-like hues. Look a little closer and bacteria-like shapes reveal themselves, like images seen through a microscope. Grab a pint at the Builders Arms Hotel and nab one of the outdoor seats to take a good look at this kaleidoscopic work by Amanda Morgan, which challenges the viewer to consider what or who determines the occupation of a place. If the mid-winter chill gets you, you can check out the work from inside the pub: the projection filtering in through the window makes great mood lighting. The Atherton Gardens housing blocks have a temporary coat of colours thanks to Somali-Australian artist Susan Maco Forrester and Indigenous artist Jody Haines. The work on Atherton Towers' western face is the festival's largest, and draws on both artists' cultural backgrounds, identity and connections to ancestors. Rose Chong's costume shop is a heaven-made match for Gertrude Street Projection Festival. On a typical day, the store's window display brightens up the strip, but during the festival they take things up a notch with artist-made installations. This year they've re-teamed with local collective Skunk Control to present an illuminated garden of feathery alien blooms and mystical orbs. For this year's festival, artist Ian de Gruchy has reworked a projection piece he created 30 years ago. The chaotic original was a montage featuring fragments of photographs of walls in New York, Amsterdam and Berlin (including the Berlin Wall). This new iteration draws on the dystopian world we live in today, drawing a disturbing parallel between the present and the past. The shadow monsters gracing the Australian Print Workshop draw on Japanese and Soviet folklore, and the stories told to artists Kyoko Imazu and Olga and Vira Ishchuk during their childhoods. Spooky. This installation by Pierre Proske and Jobe Williams overlays portraits of people's faces, creating strange yet attractive new faces in the process. You can take a selfie and get involved if you want to see what your features look like merged with a stranger's face. Below the towers on the corner of Brunswick and Gertrude Streets, artists from Yarra Youth Services, along with MicroPress Silent Army, have created hand-drawn light box installations. The young artists' humorous illustrations are responses to the theme of 'Open Minded Futures'. Artist Glynn Urquhart has turned one of Gertrude Street's oldest shopfronts into a living, pulsing thing with Future Flesh Forms. The 3D-rendered work explores how living tissue might interact with technology, creating organic shapes that are creepy yet playful. 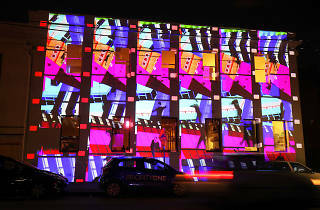 Gertrude Street Projection Festival runs until Sunday July 30; check out their map to see what works are where. The free GSPF closing night party takes place Saturday July 29 at The Catfish from 8pm, and features Mildlife, Rings Around Saturn, Waving At Trains DJs, and visuals by Dylan Betalic. Check out all the other great events happening this weekend in Melbourne.